These pets have been saved, thanks to their rescuer and the kindness of foster carers who are looking after them temporarily, but they are still looking for homes. Please note that descriptions of dogs as either purebred or a cross of particular breeds is given in good faith and is based on assessment of the dog's features, together with veterinary opinion. We cannot guarantee the age, breed or purebred status of any dogs listed. There is a two week trial period if you decide you would like to adopt a dog. This is to ensure that everyone is happy with their new family member and also that the dog is happy in their new home. Rachel is a lovely girl who has spent most of her life with a very elderly owner that cared for her well but was not really able to give her what she needed so she hasn't had much training in her life and was pretty much left to her own devices in her home. When she initially came into care Rachel was quite stubborn and not used to rules. She was also quite wary of new people as she probably led quite a sheltered and lonely life. Rachel's fear of some things meant she was quite snappy at first but she has blossomed in foster care over the past month or two and has transformed into a sweet girl. She is an affectionate dog who needs a home where she will get lots of love and attention but also one where she will continue her training in a very positive and gentle way. Even though Rachel has improved a home without children under 12 years would be better for her. 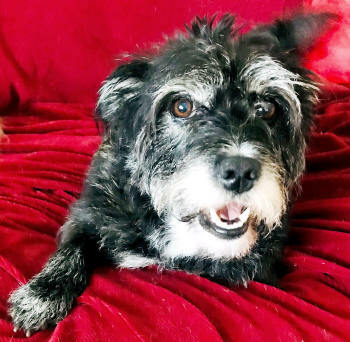 She is not suited to a home with cats but doesn't mind other dogs and, if there is one in the home, it would ideally be another small, easy going male companion. Rachel needs to get out, see the world and have some fun so active owners who don't work full time will be best for her. Just give her time and patience and take her for out for walks and to the beach and then you'll be rewarded with love from this beautiful little girl. Rachel is house trained and can use a doggy door. Rachel comes desexed, microchipped, vaccinated, wormed, on monthly heartworm prevention and with NSW Local Council lifetime registration for $495. 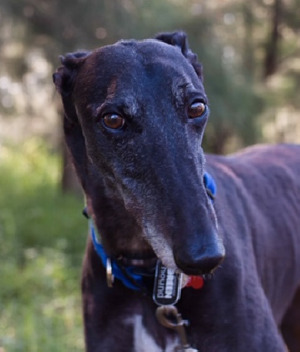 She is not available for adoption outside NSW (except ACT). Please email tania@paws.com.au for more information on Rachel. Bumble Bee is just a big baby! He's an incredibly loving Great Dane X that wants to be around you and have cuddles on the couch or the bed. No one will ever be happier to welcome you home from work or even just after a 5 minute absence! After a 2km morning walk he is tired and sleeps the rest of the day before his night time walk. Bumblebee walks well on a lead but can pull when he wants to go say hello to a dog or smell a particular patch. He doesn't have an aggressive bone in his body and would do well as a second dog. Bumblebee is good with kids and is very gentle but also large at 53kg so may inadvertently knock a little one over, hence a home with kids over 10 years would be a better match for him. Bumblebee is house trained, has learnt to sit on command and if left alone enjoys a chew treat to keep him entertained. Bumblebee wants to be a part of the families activities and go where you go as he's just a big smoocher! Bumblebee comes desexed, microchipped, vaccinated, wormed and on monthly heartworm prevention for $450. He is not available for adoption outside NSW (except ACT). Please email tania@paws.com.au if you would like more information on Bumblebee. This beautiful boy is the whole package! Astro is super friendly and easy going, happily gets on with other dogs and cats and loves going out in the car. 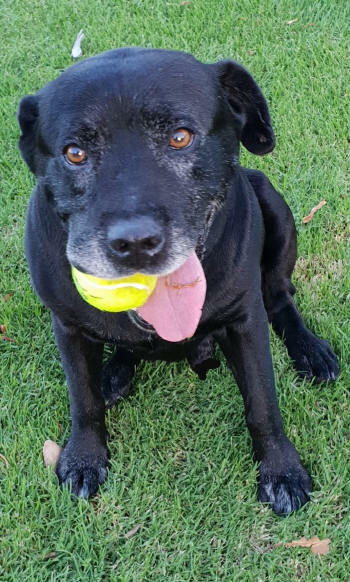 He also enjoys going for walks and to the beach, is great on lead and has good energy for a middle aged boy weighing around 25kgs.This boy has a real zest for life so approaches everything with enthusiasm and really deserves a fun and fulfilled life. Astro is great with kids, loves his tennis ball and wants nothing more than to spend time with you so a home where his owners are around a fair bit and are reasonably active is important. Astro comes desexed,microchipped, vaccinated, wormed, on monthly heartworm prevention and with NSW Local Council lifetime registration for $350. 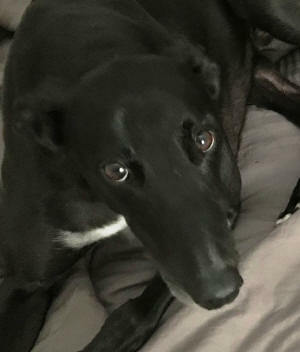 He is not available for adoption outside NSW (except ACT). Please email tania@paws.com.au if you would like more information on Astro. Rex is a beautiful green collar rescue greyhound who weighs approx 33kgs and who gets on with other greyhounds but is shy. He is very sweet and loves cuddles and going for walks. Rex would love to be able to sleep on your bed but is also happy in his own bed on the floor next to you at night. He loves to go out anywhere you are going but will also happily snooze on his day bed during the day when you're busy. Rex is used to being gently brushed each day for a few minutes and, when settled and happy, wags his tail 'helicopter style' to show he's relaxed. He is learning commands well and is house trained in his foster home where he is in care with two other dogs. Rex is fine around them and small dogs but can bark a bit around large dogs though does improve when they are gentle around him. He also loves his twice daily walks so he can have some 'sniff time'. Rex does not pull on lead but does get excited at the sound of the door bell and can rush out the front door in his excitement so continued training and a lead positioned at the front door to keep him safe before opening it are a must. He enjoys playing with toys and being with his carer so ideally he'd love and deserves to have company most of the time. Milo is a beautiful boy who has come into care as a result of a divorce and is now looking for his forever home. Milo is a very active and fun loving boy who loves to sit with and on you, loves cuddles and pats and really loves to shower you with licks and kisses! Milo is a little timid around new people and new dogs, particularly large ones, but warms up fairly quickly. He is very clever having learnt to sit and shake paws already so definitely needs a home where he will get lots of stimulation, exercise and attention and also the company of another very playful dog in the home. Milo is small in size and weighs just over 9kg so a well matched play companion is a must. 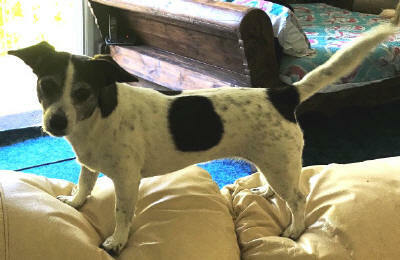 Of course, as a Jack Russell, Milo is high energy and lots of fun so good space for him to run and play is important. He can also jump quite high and, like all his breed, enjoys exploring so extremely secure fencing and security from the street is needed. Milo will bark at new sounds around the home and new dogs as he meets them and gets to know them. He has improved in foster care however, when he moves to his new home, Milo will need ongoing training and understanding. His barking is based on fear (especially of larger dogs) but he is actually a very gentle, though quite scared soul. 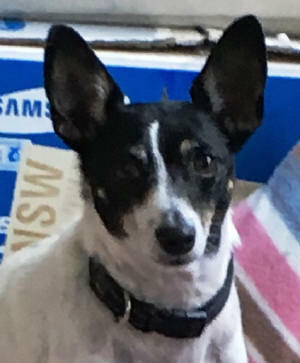 Milo will initially be a bit noisy in a new environment so a home that can cope with this is important as it may take a few months for him to truly settle down and experience with the Jack Russell breed is imperative. Milo is low maintenance in terms of grooming but does need regular brushing as he does shed hair. Honeybun is a gorgeous, sweet and small girl who is looking for someone to love her very much. 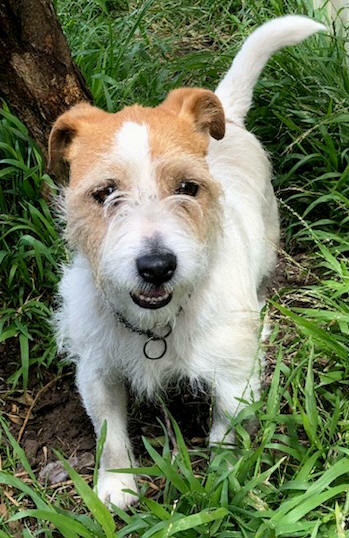 Honeybun is great with the other dogs she is being fostered with and initiates the 'play bow' occasionally but generally she just loves to be around her humans and really enjoys tummy rubs and cuddles on the lounge. Like all her breed, she loves to snuggle on the bed with you and get in under the covers at night and in winter. Honeybun is a little shy around new people and does look to her carer for reassurance but, when settled, her tail never stops. She loves playing with small fluffy toys and runs around with them often. Honeybun would eat like a horse if you let her and is not a fussy eater at all! She does need to have her waistline maintained with good exercise and loves a walk. Honeybun would be best suited to a home where her humans are not out all day. She loves the car and thinks any outing is great so you can take her anywhere you go. If there is another dog in the home it should be an easy going male as she prefers having a boy dog for company to another female. Honeybun is house trained and can use a doggy door but is not suited to a home where there is a resident cat. 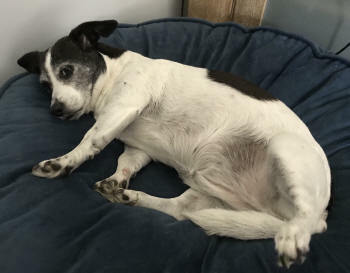 Whilst Honeybun loves to snooze and cuddle, she is a spritely 8 years young and, like all the Foxy breed, is active so needs a home with active owners who walk each day and can take her to the park and the beach to run and play and enjoy all life has to offer. Kiki is an exceptionally loving girl with a very soft nature. She forms deep, lasting attachments to her people and has a dependent type nature so really just wants to be by your side as much as she can and on your lap is even better! This darling girl really cannot get enough snuggles and cuddles. Kiki weighs around 10 kilos, is currently living with three other dogs and a cat and gets along famously with them all. She loves going out for walks and to the park where she stays by your side. Kiki was not walked or socialised with other dogs until she came into rescue so will run up to other dogs and bark at them in excitement but responds to positive correction. Her new owner will need to be experienced enough to continue with her training to manage and improve this behaviour. Kiki needs a home with someone who is around a fair bit of the time as she is just so people oriented. She does well with other gentle, friendly dogs who aren't too rowdy and is she is good with children over 5 years. Kiki doesn't like rough games and isn't the sporty, ball chasing type although she doesn't mind a gentle rumble but prefers playing with her soft toys and going for a car ride and a walk. Wherever you're going, she wants to go too and at night just wants to get under the blankets and snuggle in with you. Simba is the cutest bundle of joy! This little man loves his miniature tennis ball and will chase it and return it endlessly. He loves his walks, his cuddles, his food, his position on the bed at night and the recliner during the day (right beside his human). Simba is dog friendly but, most of all, he would enjoy owners that were around most of the time. He loves kids and is generally very easy going but is best suited to a home where he will be someone's number one. Simba does love to chase a few birds in the backyard and have a little bark around the fence line but responds excellently to his foster carer and will come immediately when called. He had often been left outside in his old home and his house training is almost there but he will still require some ongoing training. Simba is an active and fun loving boy who loves the car, any outings, a good long walk , loads of cuddles and kisses and lots of playtime in the garden. 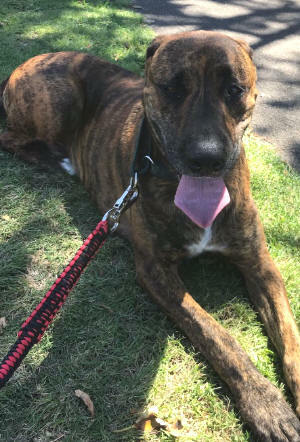 He is not suited to apartment or courtyard life and needs active and playful owners that will take him to the beach and the park and anywhere else they are going. His coat will need regular professional grooming.